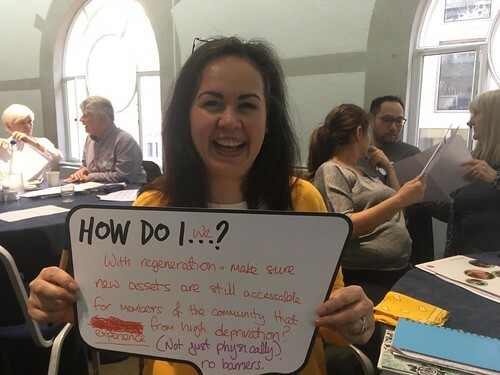 In his final blog about residents’ experiences of Big Local, Jeremy Yung finds that ‘challenging but worth it’ sums it up, and that these largely positive experiences of Big Local are contributing to people feeling better about their community. Click to read the first, second, third and fourth blogs in the series. What are people’s experiences of Big Local? Do they find it challenging? Is it satisfying? We asked partnership members to tell us their experiences about being involved in Big Local. This is what they told us. In general, people had a positive experience of Big Local with more than half of respondents finding it satisfying (59%), worth it (58%), a learning experience (58%) or friendly (52%). However, it is not all just good experiences. Two-thirds of people said Big Local was challenging (not always a negative) and more than half found it frustrating (52%). On the other end, not many found it boring (3%) or lonely (4%). People’s generally positive experiences of Big Local contributed them feeling better about their community. As a long term and resident-led programme, we hope that people will continue to build on their experiences of Big Local and contribute their knowledge, skills and energy to making their area an even better place to live. So far, signs are encouraging as most members plan to remain involved with Big Local. In one Big Local area, they went through the unexpected liquidation of their locally trusted organisation. While, over time, they have recovered some of the money, the immediate impact was ‘catastrophic’. The two workers were made redundant, the lease on their local community hub became invalid and all of the records were locked down by the liquidators. This could have easily derailed the partnership and threatened what they had accomplished so far. Instead, the partnership rallied to piece together a viable solution. Thanks to the partnership members, the goodwill of staff, volunteers and the local council, the hub never closed and the activities continued. While it was a difficult situation, the community rallied together to keep Big Local going and, since then, the partnership has ‘grown immeasurably in understanding and confidence’ from the experience. While the case study reflects some exceptional circumstances, it does show the level of commitment of partnership members, volunteers and partners even when the experience may be beyond what they signed up for! People’s experiences with Big Local is generally positive. People have a better sense of community through their involvement and remain committed to their Big Local. While this is encouraging there are also challenges and frustrations that, if not dealt with, can negatively affect individuals, partnerships and the community. We have guidance on managing volunteers to ensure that their experiences remain positive, read about it here. Do you have any stories about your own experiences with Big Local? Share them with us on Facebook and Twitter. Click to read Jeremy’s first, second, third and fourth blog in the series.